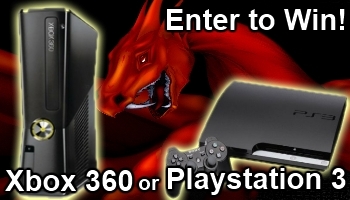 [Giveaway] Win a Xbox 360 or a Playstation 3 ! There is no need to give you an introductory note on explaining how awesome both the consoles are. Consoles are a gamer’s best friend and there are no reasons why you shouldn’t own one. The stunning graphics and amazing gameplay that both the consoles offer are fascinating . Moreover, the multiplayer gaming takes the consoles to a whole new level of awesomeness. In this giveaway, you will have the opportunity to win either the Xbox 360 250 GB or the Playstation 3 160 GB ! It’s your choice when you are selected as the winner. Cool isn’t it ? I would like to thank Justin Germino of Dragonblogger.com, one of the greatest tech bloggers, to come up with this great initiative. He has not only arranged this giveaway but had carried out many out of which the iPad giveaway was a hit ! Techetron is co-sponsoring this giveaway along with Joetech.com, MetallMan and of course, Dragonblogger.com. Do visit their blogs to keep yourself updated with the latest technology news ! The contest will end on August 31 2012 and in order to participate in this, you have to complete the following entries from the widget below. How will the winner be selected ? Rafflcopter will randomly choose a winner by using the method of Random.org. The contest is open for anyone around the world. If you are from outside the US, instead of receiving the console you will be receiving the cash value to be paid via Paypal. TIP: Earn more entries to have a better chance in winning !! Although it will be a random draw for the winner but if you have more entries, you will have more chances to win ! Hello names Marcus im 16 from Paola, KS and I was really hoping that i would get a ps3 or an xbox but my parents have money issues that had gotten in the way and i’ve worked hard to get either ps3 or Xbox but no matter how hard i try i can’t get there so the reason why i leave this comment is to hope in return to get get a game system and heres my email [email protected] and i really hope to hear from thanks for your time Marcus and i promise this not a spam or anything like that. Definitely PS3. I have always been a PS fans since PS1. Definetyl the Xbox 360 Halo 4! XBOX just in time for HALO 4! Xbox 360 Giveaway FTW ! Thanks Justin for giving us the opportunity to win this contest. Thanks. Man this xbox will be awesome once I attract it into my household! Halo rech is actually so much fun! MW3 is meh I hope the next halo is damn right crazy! Thanks techetron! I really want a break from playing stupid PC games as I don’t have a graphic card installed on my comp. Xbox 360 so I can play Halo games with my boys. Best of Luck Jeff !! Halo is one of my favourite games too ! A Masterpiece! HI, i hope to win this! this looks super cool 😀 thanks for the post, you’re amazing!!! Hoping to win this !! Fingers crossed ! ! !